When Darrelle Revis was in his prime, there was no discussion – Revis was the best cover corner in the NFL. His shutdown prowess was good enough to earn him the nickname ‘Revis Island’ – the place that receivers became stranded on game day only to resurface once the action was finished. With Revis gone, and a host of young and talented cornerbacks entering the league over the past few seasons, the battle for the throne of the game’s best cornerback has suddenly intensified. 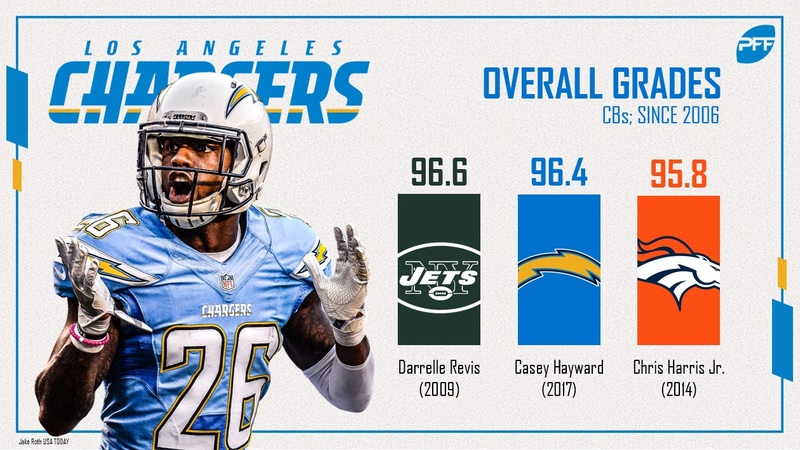 He won’t be the first name on most people’s lips, but Casey Hayward may have the best case of any corner to be known as the top cornerback in the game. Last season, his overall PFF grade wasn’t just the highest in the league, it was the second-highest overall grade we have ever seen from a corner, trailing only that otherworldly Revis season of 2009. Our advanced charting data for last season shows Hayward with the highest percentage of tight-window throws on targets, meaning even when the ball came his way he was in tighter coverage than other corners. He also did this despite running a gauntlet of top quality receivers including a rejuvenated Josh Gordon in Week 13. Hayward had four picks and 15 pass breakups on the season, allowing just 42.7 percent of passes thrown his way to be caught, the best mark in the league among starters, despite tracking No. 1 receivers. It’s impressive how underrated Chris Harris Jr. remains despite years of top quality play. He may not be the best cornerback in the game, but he’s not far off and likely is the best slot corner. Harris starts outside for Denver in base defense, but then kicks inside to man the slot in sub packages, ranking in the top three in coverage snaps per reception in each of the last three seasons. He has been a quality run defender and coverage man and has a knack for coming up with big plays at key times for the Broncos. A surprise star in 2016, A.J. 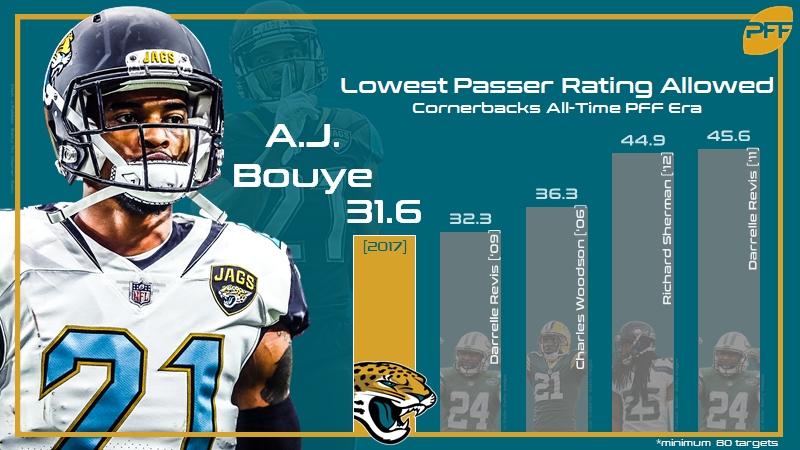 Bouye parlayed that season into a big contract from the Jacksonville Jaguars last offseason and then backed that up with an even better one, reinforcing his credentials as one of the best in the game. Bouye allowed a passer rating of just 31.6 last season when targeted – the best in the NFL – and didn’t allow a touchdown all year. 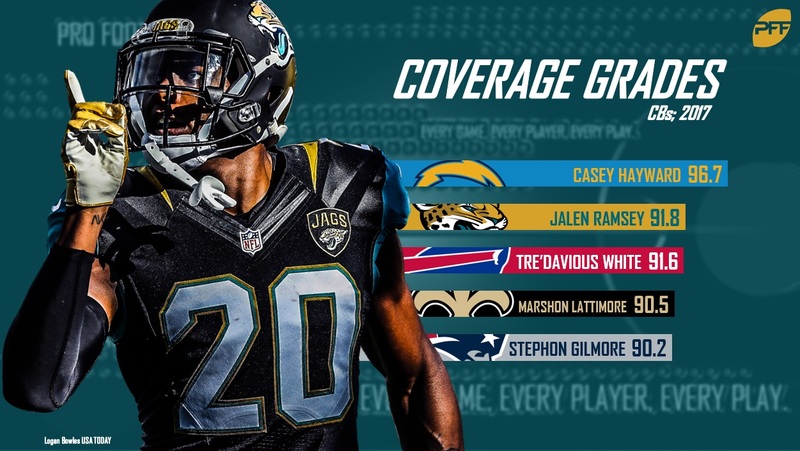 With Jalen Ramsey in partnership, the Jaguars had the game’s best cornerback duo last year and hope to for seasons to come. Aqib Talib has always flashed talent, but it wasn’t until 2016 that he put it all together and had a dominant season without lapses. He was able to back it up in 2017 despite a change in scheme and a pivot to more zone coverage. Talib gave up just 250 receiving yards all season. In the last two seasons combined, he hasn’t allowed a catch longer than 32 yards and now he returns to the scheme that allowed him a career year in 2016, reuniting with Wade Phillips in Los Angeles on a dominant looking Rams defense. Jalen Ramsey was good right off the bat, as he finished his rookie season on fire, notching nine pass breakups in his final five games of the season. In Year 2, he proved to be one of the best corners in football with an overall PFF grade of 91.8. Ramsey had five interceptions and 10 pass breakups over the year, and had eight games in which he surrendered 25 or fewer receiving yards. Ramsey is still just two years into his NFL career and could get even better in Year 3, especially surrounded by one of the game’s best defenses. 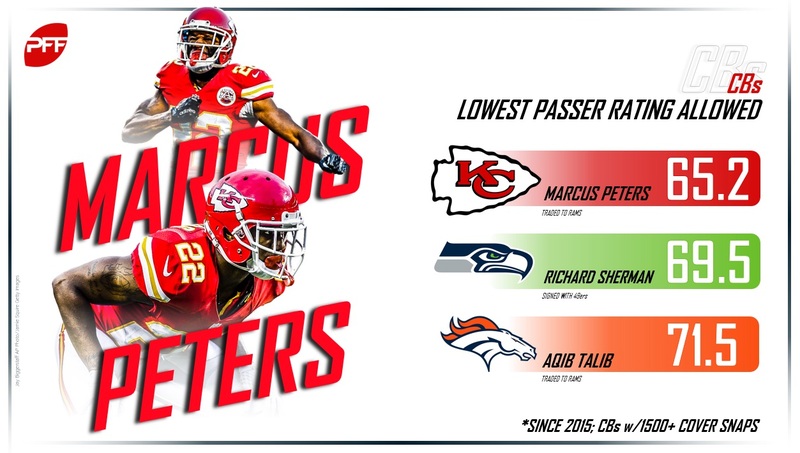 I don’t know that Marcus Peters really belongs in the conversation of the best cornerback in football, but he does have the talent to get there. Peters has been a boom or bust player thus far in his career, with an absurd 21 interceptions and 34 pass breakups over his first three seasons, but with 15 touchdowns to offset some of those big plays. Peters is a corner always looking to make plays, showing up on the field in areas that he has no business being from the play call on the chalk board. If he can iron out the bad plays in his game, he could easily be a contender for this crown but until then, he is too high-variance to overhaul some of these other players. Tre’Davious White had the highest PFF coverage grade of any of the draft prospects in his last year of college and picked up in the NFL exactly where he left off, notching an overall grade of 92.0, trailing only Hayward and winning PFF’s Rookie of the Year. 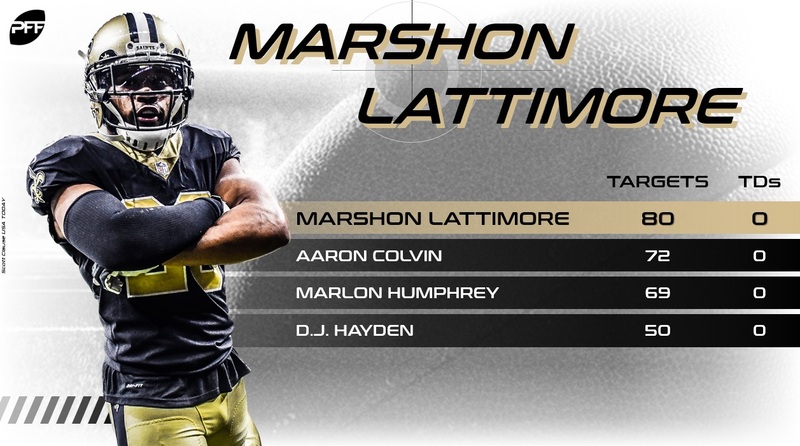 The impact Marshon Lattimore had on the New Orleans defense was dramatic and he was the single biggest driver of that unit’s transformation in 2017. He didn’t surrender a touchdown all season long and allowed a passer rating of only 51.3 when targeted, including the playoffs. Lattimore was so good that he drew 1-on-1 assignments against Julio Jones twice during the season, and while Jones did get the better of him at times, it was a back and forth battle in which the rookie did not look out of his depth. When covering receivers not named Julio Jones, the passer rating he allowed was just 42.9, only marginally higher than if the quarterback had just thrown the ball away every play instead. 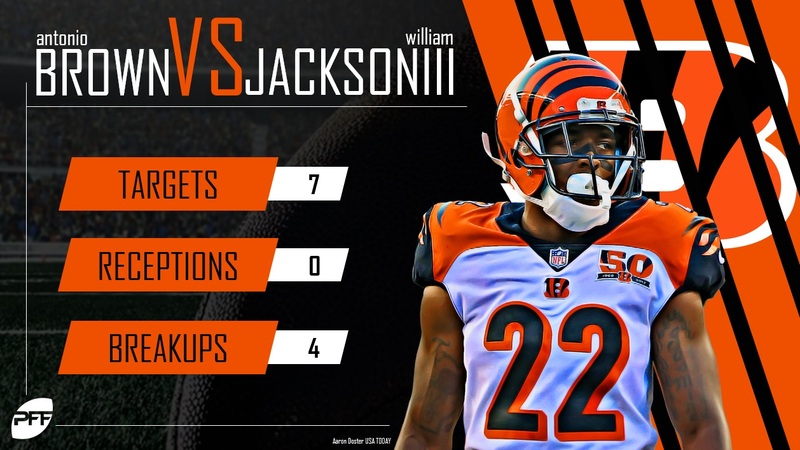 If you combine half a dozen advanced cornerback coverage metrics you could make the case that William Jackson III had the greatest statistical season PFF has seen over the past 12 seasons. Missing his entire rookie season due to injury, Jackson’s first NFL action came in 2017, and for some reason the Bengals didn’t employ him as a full-time player despite clear evidence he was the best coverage player in their secondary. He allowed just 34.9 percent of passes thrown his way to be caught (the best mark in the league), a passer rating of 36.1 (the second-best), just 0.4 yards per coverage snap (by far the best) and went 26.4 snaps in coverage for every catch he surrendered – five more than any other corner. What really seals the case for Jackson though is his performance against Antonio Brown. Across two games, Jackson covered Brown extensively, and on seven targets did not allow Brown to catch the ball, breaking up four of those targets. After Revis, there was Richard Sherman in his prime, and while Sherman is just 30 years old right now, he is coming off an Achilles injury and now plying his trade in a new city, albeit running a similar defensive scheme. After Sherman’s rookie season, he was either first or second for five straight years in coverage snaps per reception allowed before that Achilles injury that ended his 2017 campaign. Simply put, there was no cornerback harder to complete a pass on than Sherman and that, after all is the primary function of the position. Sherman has also always been an aggressive and physical run defender and has shown the ball skills to punish quarterbacks that do decide to test him in coverage. At his best, he definitely belongs in this conversation, and may be the only player on this list that has actually sat on that throne, but heading into the 2018 season the question is what player are we going to see post injury? Patrick Peterson may have the hardest assignment in football when it comes to the cornerback position. He draws the Revis role of shadowing No. 1 receivers and has tracked them into the slot, something few corners have ever been asked to do – even ones that track receivers across the field. 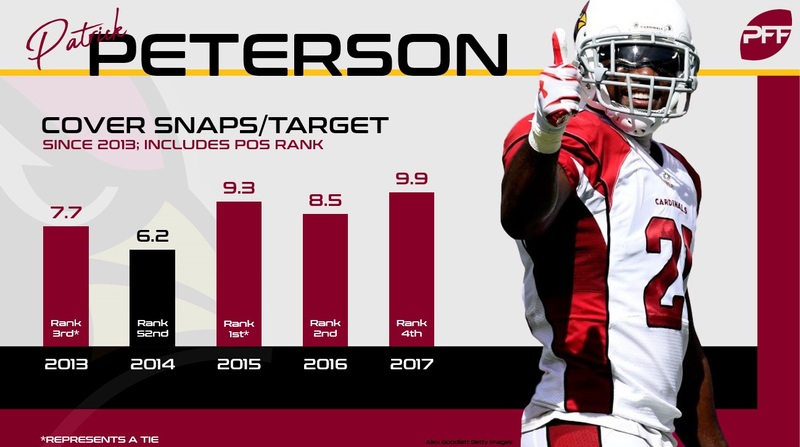 Peterson is good enough, and the difference between him and the rest of the Arizona secondary has usually been significant enough, so much so that he has ranked among the four least-targeted corners in the game four out of the past five years. Only Jackson allowed a reception less often than Peterson in 2017 and Jackson wasn’t starting, let alone tracking No. 1 receivers the way Peterson was. At his best, Peterson definitely has the quality to be the best corner in the game, but he surrendered four touchdowns in 2017 and can be beaten more than his supporters like to admit. The most obvious name that people will expect to see in this debate that won’t feature for PFF beyond explaining why he isn’t in the discussion is Minnesota’s Xavier Rhodes. There is no doubt that Rhodes is a good corner, and he has begun to track No. 1 receivers now, but he is just beaten too often for a player who doesn’t offset that with as many big plays in coverage as some others. Rhodes surrendered 553 yards in coverage last season, three touchdowns, and had significant yardage hidden in the form of penalties, with his nine penalties ranking inside the top 10 among corners, eight more than somebody like Hayward. A couple of seasons ago, Josh Norman had a strong case, but his time in Washington has not helped his status as an elite cover guy. In 2017, Norman surrendered three touchdowns, and thanks to notching zero interceptions on the season, he gave up a passer rating of 114.1 when targeted. The last great year we have seen from Norman was back in 2015, in a different defensive scheme, which is looking more and more like it may be a career outlier and not an indication of his true ability. Another player who is very good, but perhaps not quite great enough to be seen as the best cornerback in the game, Darius Slay led the league in interceptions last season with eight (tied with Kevin Byard), and had 13 pass breakups, but he also surrendered three touchdowns and over 700 yards to receivers over the course of the season. Agree with this story? Chime in with your comments on our Twitter account (@PFF), and find Sam Monson & Steve Palazzolo debate who is the best cornerback in the NFL on our YouTube channel. Be sure to subscribe to our PFF YouTube channel for more exclusive content.